Have your holiday cards postmarked "Christmas, Florida!" Yes, Virginia... there really is a Christmas. Well, at least there is a Christmas, Florida. Florida may not see much snow, but the small post office near the historical Fort Christmas sees plenty of activity prior to the holidays. People come from miles around to have their Christmas cards and holiday mail postmarked "Christmas, Florida!" As you can imagine, it isn't hard to find surprises in a community where it is Christmas all year round — from the large Christmas tree perched at the corner of one intersection to Santa's reindeer and sleigh atop a building in an RV park, it is easy to see that residents are all too willing to capitalize on the town's name. The original community was called Fort Christmas, named for the time of year the fort was built in 1837. The "fort" was dropped when the first post office opened in 1892, and as they say... the rest is history. Located just a few miles north of the main highway is Fort Christmas Historical Park. A replica of the original fort, built in 1837 during the Seminole Indian War, anchors the 25-acre park that also features a traditional Florida "Cracker" house, seven pioneer homes, a sugar cane mill and historical farming equipment. Visitors to the replica-Cracker log house Visitor Center will uncover a wealth of historical information and a gift shop. The historical park also includes several picnic pavilions (including a large one that is covered and screened), restroom facilities, a unique themed children's playground, a baseball diamond, tennis, volleyball and basketball courts. The park is open Tuesday through Sunday 8:00 a.m. to 8:00 p.m. during the summer and 8:00 a.m. to 6:00 p.m. during the winter. The fort museum hours are 9:00 a.m. until 4:00 p.m. The park is closed Mondays. Admission is free. On the eastern edge of town, Jungle Adventures Nature Park is a sad reminder of roadside America's glory days. The now-faded larger-than-life alligator marks the entrance to the park where a number of exotic animals call home. Besides the animal displays, the park advertises jungle adventure shows, a jungle cruise and more. The park is open daily from 9:30 a.m. to 5:30 p.m., rain or shine. Unfortunately, we arrived too late to experience Jungle Adventures first hand, so I can't say whether the $23.95 plus tax (or $16.95 plus tax for children ages 3-11, children under age 3 are admitted free and seniors ages 60 and over $20.95) is worth the price of admission. Christmas is located about 20 miles east of Orlando along Highway 50, a road traveled by those heading to Titusville on the Space Coast. The small, but modern, post office is on your right shortly after seeing the green "Christmas" sign that marks the entrance to the town. It is decorated for the holidays year round with a holiday wreath on the outside and a Christmas tree in the lobby. In the summertime, it is a quiet place, but prior to the holidays, it bustles with activity. 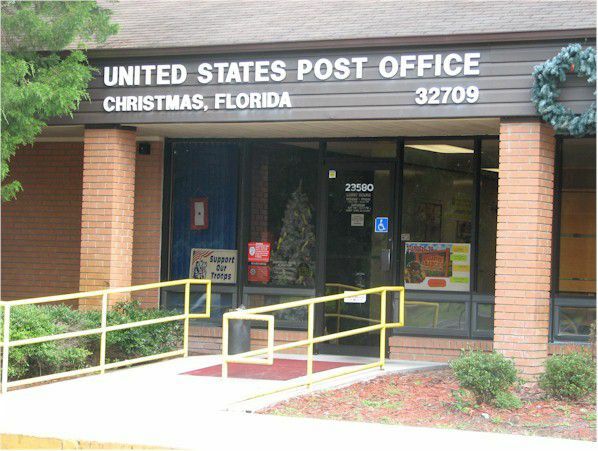 People line up for the opportunity to mail their holiday cards and letters with the unique postmark of "Christmas, FL 32709." While there is a small Christmas gift shop, there really isn't too much else in town except for the corner Circle K convenience store. If you are looking to park your camper, you are in luck at Christmas RV Park. Of course, if you are into roughing it, there is primitive camping available at Tosohatchee Reserve State Park in Christmas. Otherwise, the nearest lodging is either in Orlando or Titusville.